We've been playing around with it for a few weeks now and all we can say is that this bad boy ain't your ordinary tablet. Yes, fellas! The Yoga Tablet 2 manages to stand out from a boring sea of rectangular slabs of metal and plastic, thanks to a few nifty features the average tablet can only wish of having. The Yoga Tablet 2's powered by an Intel Atom processor, another defining factor in an industry filled with Snapdragon and MediaTek CPUs. Having an Intel processor gives the device more power and speed to take on mobile chores. Couple that with 2GB of DDR3 memory and you've got a device that can multi-task as well. Looking at it straight-on, you'll think that the Yoga Tablet 2's profile is similar to 99.9-percent of its kin. That changes though when you view it from the sides; it's actually shaped like a freakin' whistle with a super long blower, or an apostrophe with an extended tail. The aforementioned "barrel" feature holds a little dirty secret: It doubles as a stand! Turn it and the tablet now props up, freeing your hands for a better viewing experience. Can your tablet do that without your help and any accessories? We thought so. ...with the help of a Bluetooth keyboard (sold separately), of course. 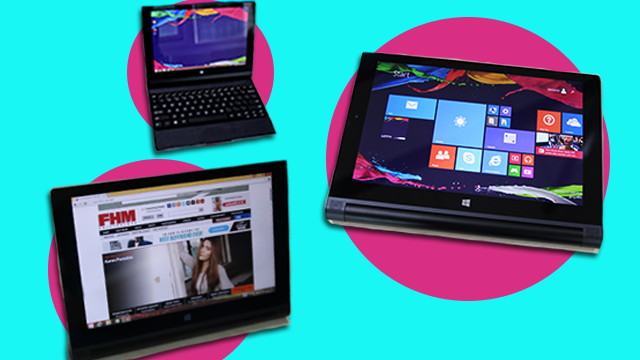 While this capability is found on most other tablets, few can boast having an Intel processor and Windows 8.1. Combine the three features and you've got yourself a legit tablet-hybrid device that will help you be more productive on-the-go. See? We told you it ain't just another run-of-the-mill device. The good news: It's available locally starting at P13,999—not bad for a productivity-focused tablet with the features above.